A comic-horror adventure with mischievous killer creatures taking over a small town, Gremlins enjoys a decent opening but runs out of ideas half-way through, and degenerates into silly puppeteering overload. In a mysterious Chinatown shop, eccentric inventor Rand Peltzer (Hoyt Axton) buys a small furry creature called a Mogwai as a Christmas present for his teenaged son Billy (Zach Galligan). The Mogwai comes with three strict rules: the creature should not be exposed to bright light and particularly not direct sunlight, should not come in contact with water, and should never be fed after midnight. In the family's quaint hometown of Kingston Falls, Billy calls his new pet Gizmo and does his best to adhere by the rules, but when an accident caused by neighbourhood kid Pete (Corey Feldman) spills water on Gizmo, the creature emits fur balls and each becomes a new Mogwai. One of the new offspring has a mohawk and a mean streak, and is labelled Stripe. Zach seeks the help of his high school science teacher (Glynn Turman), who starts to run blood tests on one of the Mogwai. The playfully malicious creatures (with the exception of Gizmo) then get their hands on some food after midnight, and after a cocoonish incubation period they transforms into ugly looking evil monsters, intent on death and destruction. Zach's mother Lynn (Frances Lee McCain) has to fight off the gremlins in her kitchen, but Stripe escapes, jumps into a pool, and creates a large army of cohorts. As the number of victims grows, Zach and his potential girlfriend Kate (Phoebe Cates) have to find a way to stop the gremlins before the whole town is destroyed. With Steven Spielberg as Executive Producer and an effective premise, the opening 40 minutes of Gremlins feature an entertaining build-up. Director Joe Dante, working from a Chris Columbus script, takes his time in introducing the little critters, the Chinatown scene appropriately mysterious, and the initial tour through Kingston Falls setting a rich stage for the mayhem to come and the colourful locals who will soon become victims. The kitchen battle scene between Mom and the first group of gremlins is a highlight, small appliances being put to good use, both the blender and microwave getting to grips with the ugly critters and causing quite the gremlin gore and juice mess. But then the film's energy ebbs away, as the novelty wears off and Dante settles for the obvious: numerous shots of numerous gremlins behaving badly, the yuks disappearing as familiarity takes over. And it's a common problem, a running gag about Dad's useless inventions equally floundering on the rocks of repetition. 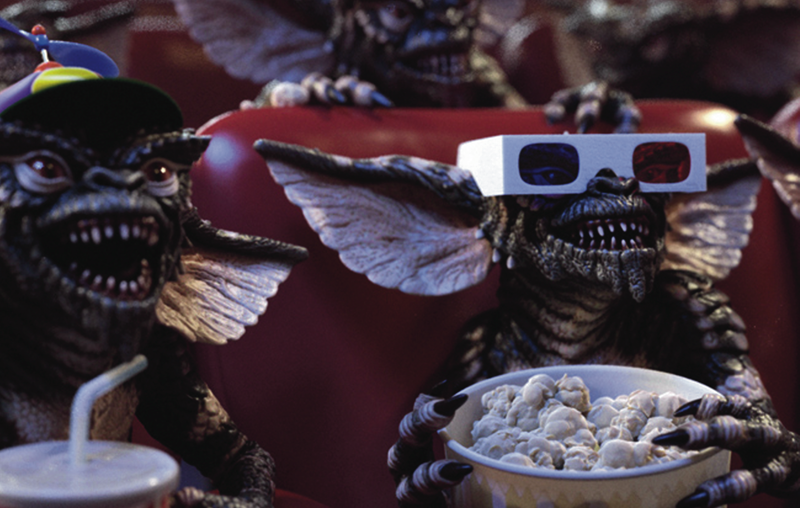 Like all jokes that stretch too far, Gremlins goes from funny to boring in a hurry. The lack of charisma in the central role does not help. Once the mayhem erupts, Zach Galligan is given very little to do, and Billy mostly comes across as an unconvincing dork playing second fiddle to an evil version of the muppet show. Better but still underutilized is Phoebe Cates, and at least she gets to deliver the film's best spooky story, sharing the reason why she really does not like Christmas. Judge Reinhold has a small role that seems to have suffered severely in the editing room. Gremlins is funny when it's furry, but soggy when it's slimy.